SAN DIEGO, California, January 3, 2014 (ENS) – Seventy-one U.S. Navy sailors from the aircraft carrier USS Ronald Reagan are filing suit against the Japanese utility Tokyo Electric Power Company, TEPCO, after they were allegedly exposed to radiation from the Fukushima Daiichi nuclear power plant when they arrived in Japan with aid. On March 11, 2011, a severe earthquake and tsunami knocked out power and emergency generators at the TEPCO nuclear plant on Japan’s Pacific coast, leaving the power plant’s nuclear fuel without cooling water. The radioactive fuel rods melted down, releasing high levels of radioactive substances into air, ocean and on land. The sailors’ lawsuit alleges that TEPCO officials knew how serious the radiation leak was and knew that American troops were heading to Japan to offer relief, but did nothing to warn them of what they were sailing into. 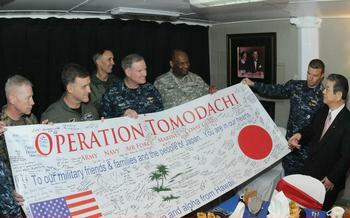 The American relief effort is known as Operation Tomodachi. 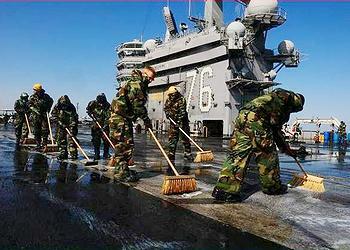 According to the lawsuit, radiation experts who assisted in the decontamination say the USS Ronald Reagan sailed straight into a plume of radioactivity, which entered the ship’s water supply. Crew members washed, brushed their teeth and drank potentially contaminated water. The lawsuit claims active duty and former sailors are suffering from cancer, blindness, impotence, and fatigue as a result of the radiation exposure. They are suing TEPCO for unspecified damages. The original lawsuit was dismissed because of jurisdictional confusion, but the plaintiffs’ lawyer, California environmental attorney Paul C. Garner, has until January 6 to amend the complaint against TEPCO and resubmit it for a judge’s ruling. Garner agreed to drop some of the allegations in the lawsuit, including a conspiracy charge, and said the judge would reconsider the case in the new year. The case began with former Aviation Boatswain’s Mate 3rd Class Lindsay Cooper, 24, who was aboard the USS Ronald Reagan in March 2011. When she got back, Garner said, she suffered drastic weight losses and gains over short periods of time, gynecological issues and a noticeable loss of energy. Her family got her in contact with the attorney, who now has 71 plaintiffs listed, with myriad health issues, the “Navy Times” reports. Garner estimated about one-third of the plaintiffs remain on active duty with the U.S. Navy; one is still assigned to the USS Ronald Reagan. A spokesman for the Navy, which is not a defendant in the case, said Reagan crew members were not exposed to enough radiation to cause long-term health effects. “For perspective, the worst-case radiation exposure for a crew member on USS Ronald Reagan is less than 25 percent of the annual radiation exposure to a member of the U.S. public from natural sources of background radiation, such as the sun, rocks and soil,” said spokesman Lt. Greg Raelson. Raelson said that aircrews delivering supplies to Fukushima were given medication to protect their thyroid glands from radiation exposure, the ship was monitored for levels of radioactivity and equipment was washed down to remove radioactive substances. Garner insists that the connection between the Fukushima Daiichi mission and their current illnesses is undeniable. “It’s hard to imagine that all of these people are suffering now when they were all basically in their early 20s, in good health, and looking forward to life,” he said. If the case is decided in the plaintiffs’ favor, Garner told the “Navy Times,” he plans to establish a fund for the victims to pay for their medical care.